Our client was a medium-size company that had over 1,800 loan officers. Within 2 weeks, we onboarded 55% of their employees (981 loan officers) to the Yip Yip platform. 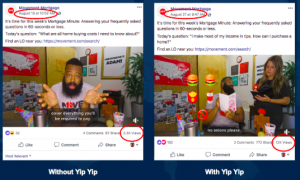 For every single post created by the marketing department using Yip Yip, 981 salespeople shared that same exact post. Why were these results immediate? The reason we saw an immediate increase in reach, engagement and clicks was because we organized and leveraged an asset that the company had, but was not using. By successfully onboarding and sharing marketing content on behalf of the 981 loan officers, the company received an extra 3,473,053 views in monthly organic reach. That’s a 141% increase in reach. 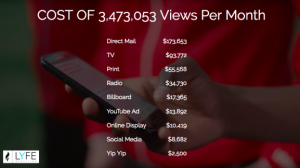 The cost of this channel saved the company hundreds of thousands of dollars in paid advertising spend, as you can see in the graphic below. Difference between content coming from a person vs. company. It’s fantastic to see the impact and reach, but here’s why this strategy was so powerful. Content coming from a salesperson receives higher reach and conversions. 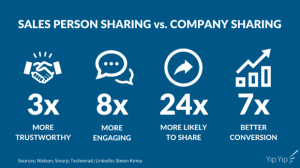 When employees, salespeople, or for this example loan officers are consistently sharing marketing content on social media, their network finds it 3x more trustworthy, 8x more engaging, 24x more likely to share and produces 7x higher conversions! We have seen these results with our Yip Yip Lead Generation clients. To access our lead generation case study and see a tested example of a significantly higher conversion rate, download our case study below! Click here to see the GiANT Worldwide Case Study. Sneak Peak: Collectively they received 60+ leads every time the marketer promoted a landing page through the Yip Yip platform. How can you receive the same results and convince your sales team or network to share your marketing message? We have created a simple framework based off of our thousands of onboardings. Here is the simple step-by-step strategy to ensure a successful implementation. One of the biggest mistakes I see when marketers try implementing a social advocacy, social employees or social selling program is that their content does not align with the end-user’s ultimate goal. Most often, the goal is to spread reach, engagement and conversions for the corporate brand, not the individual sales rep. This results in low participation from sales reps because they are focused on reaching their objectives and solving their challenges. In fact, most of our customers choose us because we highly promote the end user’s success, rather than simply promoting the company content. We’ve had reps from client’s actually choose not to share company content because leads would go to corporate instead of their personal business. Those leads would then be assigned to a different rep, instead of going to the rep that attracted the lead in the first place. 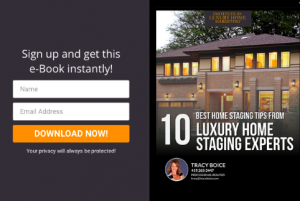 For this client, we solved this by giving each rep personalized sites and lead-hooks. Movement Mortgage success in onboarding and adoption was primarily due to them solving their loan officers’ biggest problems. They don’t want to spend a lot of time on social media. Movement was then helping their loan officers by providing a solution that automatically posted Movement content to each loan officer’s social media channel. 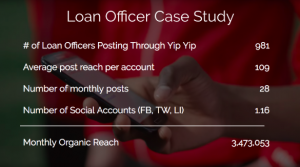 Because they were aligned, the loan officers had no issue connecting their social media accounts since posting Movement content was saving them time! This resulted in Movement receiving significantly more clicks, engagements and views – the activities that drive opportunities and revenue. Once you’ve identified how you will align this service with your sales team’s success, you’ll want to make sure you effectively engage your sales team and/or network with this opportunity. At Yip Yip, we offer onboarding resources, such as emails, graphics, videos, etc. to ensure a smooth launch. Contact us today if you’d like to learn more about our launch process. Here is the schedule that we use to launch hundreds to thousands of users in less than a week. Day 3: Yip Yip sends or creates promotion materials (blog, videos), and provides admin training. Engage user list by email. Send invitation and start onboarding. Day 5: Yip Yip leads informational webinar or live meeting. Onboard interested users. Day 7: Send your first Yip Yip post. 3) Consistently Create Posts Through Yip Yip. After you have onboarded your 10, 100 or 1000+ sales reps inside Yip Yip, your admin will now have the ability to promote content directly to each users social media channel. This is how Movement Mortgage’s marketing manager was able to send out 900+ posts at the push of a button to social media, generating millions of impressions and thousands of engagements and clicks every month. See how easy it is for one admin to create a post inside Yip Yip! More conversations create more opportunities. It’s amazing to see the benefit when sales reps are actively aligned with marketing and amplifying company content on social media. How about you? Do you have a team of sales reps or a network that could benefit from sharing your content? What would your business look like if 5X more people saw you every month and you received 4x more traffic to your site? Schedule a call with our team to see if Yip Yip can increase your reach, conversations and opportunities! If you’d like to learn more, download our case study and see how Yip Yip helped one company generate over 2 MILLION organic impressions in as little as 45 days.